When Laurence Glasco traveled to China in 1989, a Chinese band played for the group of visiting Americans and struck up a medley of Stephen Foster songs. A statue that sits on Forbes Avenue near the Carnegie Museum of Art commemorates Foster — a Pittsburgh native — and his contributions to American music. But the statue — which has prompted controversy in the past — has recently become an even greater point of contention, receiving national attention and mention in The New York Times, the Pittsburgh Post-Gazette and a widely circulated article by Very Smart Brothas’ Damon Young. The monument was completed in 1900 and was located in Highland Park, but after being vandalized repeatedly, it was moved to Oakland during the 1940s. 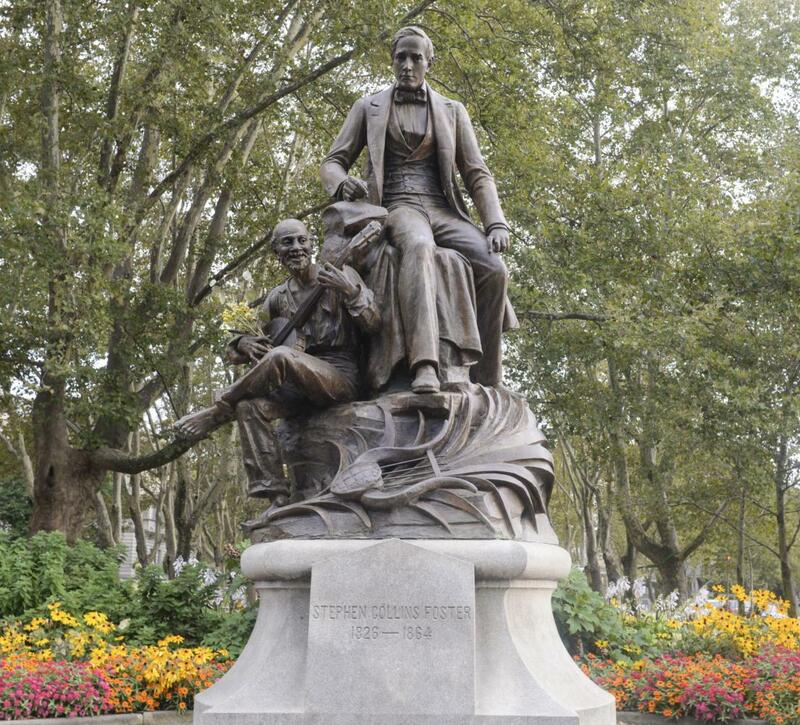 The statue depicts Foster standing tall, dressed as a gentleman, with a black man sitting at his feet. The black man is toothless, wearing tattered clothing and strumming a banjo while Stephen Foster stares off into the distance and transcribes one of his iconic songs — “Uncle Ned,” a song about a slave. Kirk Savage, a professor in the history of art and architecture department, said a statue can be offensive in two distinct ways — it depends on who is being represented and how. Glasco, a history professor at Pitt, said Foster was not out to demean people or to keep black people as slaves such as the Confederate generals displayed in other controversial statues. In fact, Foster never saw a slave or traveled to the south. Brytney Humphries, a senior who studies natural science and Africana studies, visited the statue last night as part of Glasco’s History of Black Pittsburgh class. Despite Glasco’s argument that Foster empathized with African-Americans, Humphries believes the statue represents cultural appropriation. “The statue represents his getting a song from another African-American, and he’s the one who gets the name at the end of the day,” Humphries said. As a historian of music, Deane Root, a Pitt music professor and chair of the department, sympathized with what he believes the sculptor was trying to portray — the inspiration given to Foster by different cultural groups, particularly inspiration from African-Americans. The Center for American Music at Pitt is home to the largest archive of Stephen Foster-related materials in the world, according to its website. While fewer than 20 of his over 200 songs are classified as minstrel music — traditionally done in blackface — such songs were extremely popular, the website says. Some of Foster’s music — such as the song “My Old Kentucky Home” — even accompanied the abolitionist stage production of the book “Uncle Tom’s Cabin.” But in the Post-reconstruction era, following his death, his songs were reinterpreted to be more derogatory. “After the Civil War, the true racists grabbed his songs and converted them into these kind of hate-filled, stereotyped images of blacks,” Glasco said. Jenea Lyles, an officer of Pitt’s Black Action Society, said she didn’t think much about the Stephen Foster monument until someone mentioned it in the BAS office. Afterwards, the sophomore microbiology and sociology double major began to research him. While the City of Pittsburgh owns the statue and the land on which it sits, about a year ago Pitt faculty and students raised concerns about the imagery of the Foster statue, located near Pitt’s campus. In response, Pitt’s Office of Diversity and Inclusion formed a group comprised of Pitt faculty experts, students and representatives from the Carnegie Library, Carnegie Museum of Art and City of Pittsburgh, according to Pam Connelly, vice chancellor for the office. The group provided the city with contextual information, including the history of Stephen Foster, the history of the statue and varying opinions of the group members. The Pittsburgh Art Commission and Historic Review Commission are currently reviewing the statue. A petition on change.org urging the commission to remove the statue has garnered more than 1,000 signatures in one week. Although the statue is still under review, last Friday, Mayor Bill Peduto personally came out in favor of moving the statue to a different location. Glasco, who has used the statue as a teaching tool, would prefer the monument to remain in a public space. He feels keeping it in a public space will make people more aware of their environment and will prompt those who are offended to learn about the statue.